MA Argona is a multi purposes Magento Theme. If you’re going to open your online store using Magento Go service and sell watches, bikes and furniture or luxury stuffs, or you looking for a clean and nice design, this template is perfectly your choice. Homepage contains image slideshow, brand sliders; the footer with extra space allows to show more info of your stores address or links. This theme has 3 templates : watch template, bike template and furniture template. These template are designed mainly in green and light yellow. With those green block colors, no need to say, clients can also feel shop’s spirit, as a common place for people love watches, bikes and furniture. shop by” function will filter products by price. Information of products is not only provided on single product page but also general product page. It helps customers to have quick glimpse on them. Customers will save massive shopping time with it. Currency exchange, language translator, and newsletter are also available. Surfing on mobiles struggles with small screen, since it is really hard to watch product in details without zooming in or out. It has extremely well-organized, yet keep it super informative. Searching field is just under logo, not difficult to see and easy to use, it helps customers can find products in few seconds. Product categories are shown in the most logical way, to avoid using confusion for visitors. Some featured products still appear on the homepage with minimized prolix details. 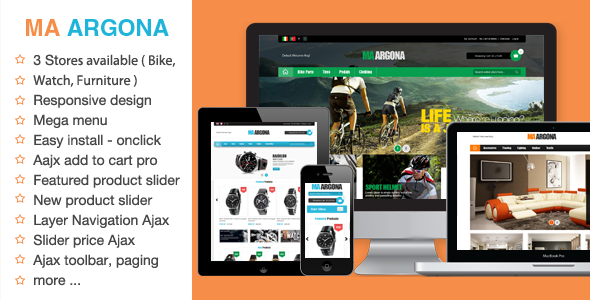 Item Reviewed: MA ARGONA - Responsive Magento Theme 9 out of 10 based on 10 ratings. 9 user reviews.